Single Deck Blackjack is the most lucrative game a blackjack player can find and WGS (formerly Vegas Tech) version is the best of the bunch, second only to the one offered by Bovada and Ignition casinos. Unlike most Vegas casinos which lowered the payouts to 6/5, WGS Vegas Single Deck blackjack stayed loyal to the original 3/2. The game carries three important advantages: first, the minimum bet is just $2, vs. $25 in Bovada blackjack (free play). Second, it’s available for mobile play and third, it’s open to USA players, which is great. Unfortunately, this game is not available in fun mode, but here you can find 5 Free Single Deck blackjack games which you can play on our site. If the Dealer’s up card is an Ace, he will offer an insurance that pays 2:1 (and which you shouldn’t take). Dealer checks for Blackjack when holds an Ace or a 10-value card, before player makes his move. Player is allowed to double when the first two cards total 9, 10, or 11. Double after Split is allowed, except on split Aces. After doubling, you will receive 1 more card. Only 1 split per hand. 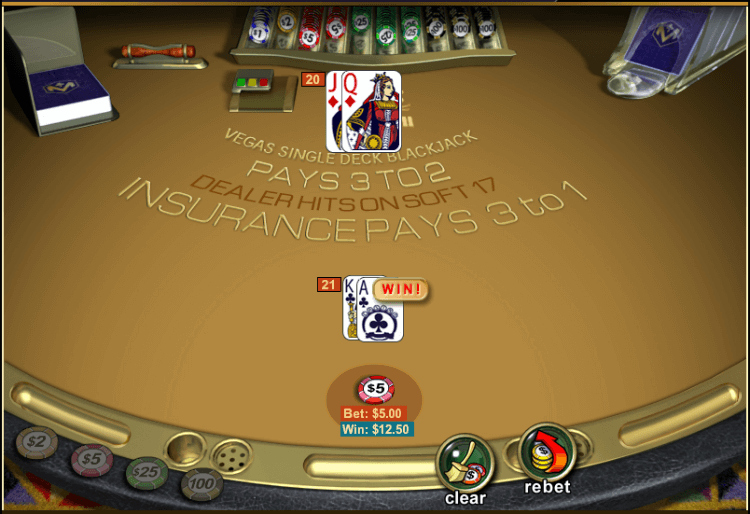 Blackjack on split hands counts as 21 (pays 1:1). As we’ve said, the game follows standard payout rules: 3:2 on blackjack, 1:1 on other winning hands. In case of a tie it’s considered a push and your bet is returned. Under these rules, the house edge is only 0.2%, which is superb! WGS Vegas Single Deck Blackjack is available in Instant Play mode or by downloading the casino software. The most recommended casinos to play this game are Miami Club and Red Stag. The minimum bet is just $2 which is perfect for those looking for low stakes blackjack tables. The maximum bet is $100, not very high, but still solid. You can play only one hand per round.